The New York Daily News brings us our strongest evidence yet that, with Tebow, we've crossed over into an entirely unfamiliar, Unsolved Mysteries-echoing realm. Russell Francis died last Saturday. His family will bury him this weekend in a Tim Tebow Jets jersey. That's not what's spectacular about this story, though. Widow Wendy Tatum recalled one of her last conversations with Francis, 44, as he battled lung cancer in a Brooklyn hospital. 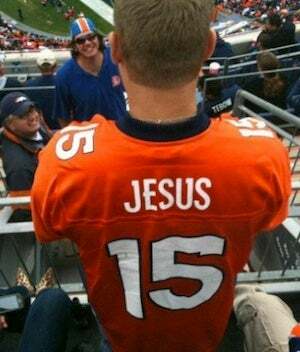 "He kept saying, ‘They're going to get Tebow. They're going to get Tebow,' " she told the Daily News after shopping for the shirt Thursday. "This was a whole week before the trade." The Daily News doesn't say, though, how Francis reacted to his visions. Were these the gleeful last gasps of a dying man? Or did he gaze into the abyss, the light fading, and see Tim Tebow's cackling visage?